I selected this book because I knew it was often read by the fifth grade class at the Waldorf school where I teach. However, it is actually a common part of many classroom curriculum, and has several classroom study guides available. This children’s book offers so many topics for discussion. Survival in the wild is just one of them. Other topics include care for the environment, the contrast between indigenous and modern cultures, the ability to move from one culture to another, and on and on. This book is so rich and vibrant. 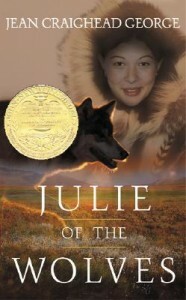 The story is based on some real people that the author encountered during her own stays in the Arctic circle. In the interest of full disclosure, there was an unsettling moment, that lasted for about 3 sentences, when the 13-year-old child husband of this child bride, angrily attempts “to mate.” While it is startling, younger readers will not make any sense of it, and older children will be able to handle it, as the incident is short, not graphic, and propels the young girl to take care of herself and leave. However, parents should know this tiny episode exists in the book. A Newbery prize winner, this children’s book is authentic, fascinating, riveting, and a little sad at the end.